Oakland’s own, for more than 30 years, the DELTA WIRES is dedicated to modern blues while paying tribute to Blues origins of the Mississippi Delta. A brainchild of vocalist, harmonica player and front man, Ernie Pinata, who holds a Master of Fine Arts degree. Pinata recognized that the blues is art, that its components are deep-rooted elements, originating out of a culturally derived art form born in the rural South, and evolving to high art through its Northern urban migration. This perspective lends serious credence to how one views and hears the blues. 30 plus years later, the DELTA WIRES continue to perform, keeping Pinata’s original vision alive, culminating in this, their 5th CD. The DELTA WIRES, representing the Sacramento Blues Society, were Finalists out of hundreds of bands at the Blues Foundation’s International Blues Challenge in Memphis. Adding to their list of recent accomplishments, they were voted “BEST LIVE BAND”, Readers’ Pick, East Bay Express and “BEST BAND/MUSICAL ACT” in Oakland Magazine’s annual readers’ poll. 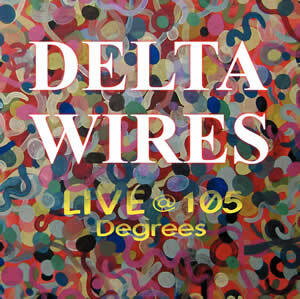 The DELTA WIRES are a high-energy musical experience and long-time crowd pleasers who are getting not only serious critical attention, but national exposure as well. Enjoy!